Panda Kitchen & Bath understands that having kitchen and bathroom cabinets is very important because they add to the overall aesthetics of your kitchen and bathroom design and they bring organization and storage capabilities. Most importantly, high quality cabinets are an investment in your home and add the greatest value to your property. At Panda Kitchen & Bath of Richmond VA, we offer a large selection of high quality natural wood kitchen and bathroom cabinets in select styles, finishes, and sizes. We keep the most current and popular styles in stock to appeal to our clients looking to update their homes. Whether you’re looking for cabinets that will add a modern aesthetic to your kitchen or bathroom, or cabinets that will uphold your home’s elegant and traditional style, Panda Kitchen & Bath has the perfect cabinets to complement your design. Panda Kitchen & Bath offers hardware and cabinet inserts from Hardware Resources. Upgrades can be made to our kitchen and bathroom cabinets using premium inserts such as trash bin pull outs, roll out tray and spice pull outs just to name a few. Hardware Resources also offers a large selection of handles and knobs to dress up your cabinets. A Cabinet Back Panel – 3/8’’ Panel With 3/4’’ Frame. B Drawer Face – 3/4’’ Solid Wood. 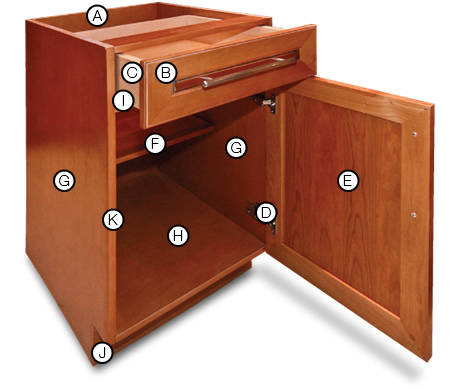 C Drawer Box – 3/4’’ Thickness Made Of 11 Layers Plywood With Dove-tail Construction (Solid Wood Drawer Box Available). D Hinges 180 Degree Full Opening Stainless Steel Hinges. E Door 3/4’’ Solid Wood. F Adjustable Shelves 3/4’’ Thickness Made Of 11 Layers Plywood. G Cabinet Side Panel 3/4’’ Thickness Made Of 11 Layers Plywood. H Cabinet Bottom & Top Panel — 3/4’’ Thickness Made Of 11 Layers Plywood. I Rails 18’’ Stainless Steel Full Extension Rails (Soft-close Rails Available)..
J Toe Kick 3/8’’ Thick Of Plywood. K European Frame Less Construction. To see the selection of cabinets we have to offer for homes in Richmond, Midlothian, Chesterfield, Glen Allen, Short Pump, Mechanicsville, Chester, Ashland, and the surrounding areas, click here.